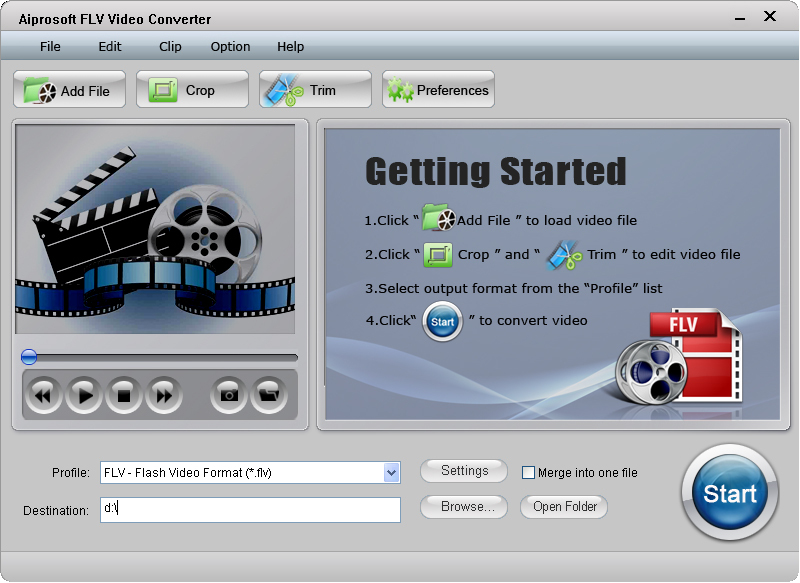 Aiprosoft FLV Video Converter is an easy-to-use FLV Converter which can convert mainstream video files to YouTube FLV, SWF format. The key formats supported are: MOV, WMV, ASF, 3GP, VOB, MPEG and AVI, even HD TS, HD MTS, HD M2TS, etc. So you could upload your own videos to YouTube and share with more friends online. Support all mainstream video and audio formats Convert video to YouTube FLV, SWF format. Aiprosoft FLV Video Converter, convert video files to YouTube FLV, SWF format. ...... edges and merging several clips into one. Possessing this FLV Video Converter, you will have a wonderful and extensive digital entertainment life! * Support all mainstream video and audio formats Convert video to YouTube FLV, SWF format. Aiprosoft FLV Video Converter can convert various videos to YouTube FLV format including MPG, MPEG, MPEG 2, VOB, DAT, MP4, M4V, TS, RM, RMVB, WMV, ASF, MKV, AVI, 3GP, 3G2, FLV, SWF, MPV, MOD, MOV, DV, DIF, MJPG, MJPEG, HD TS, HD MTS, HD M2TS, HD MPG, HD MPEG,HD MP4, HD WMV, QuickTime HD MOV, HD H.264, HD RM. Qweas is providing links to Aiprosoft FLV Video Converter 4.0.06 as a courtesy, and makes no representations regarding Aiprosoft FLV Video Converter or any other applications or any information related thereto. Any questions, complaints or claims regarding this application Aiprosoft FLV Video Converter 4.0.06 must be directed to the appropriate software vendor. You may click the publisher link of Aiprosoft FLV Video Converter on the top of this page to get more details about the vendor.